New Brunswick, N.J. - December 1, 2018 – An investigational drug that uses the body’s own defenses to fight disease has demonstrated efficacy and an acceptable safety profile in the treatment of follicular lymphoma, diffuse large B-cell lymphoma and other B cell non-Hodgkin lymphoma subtypes. 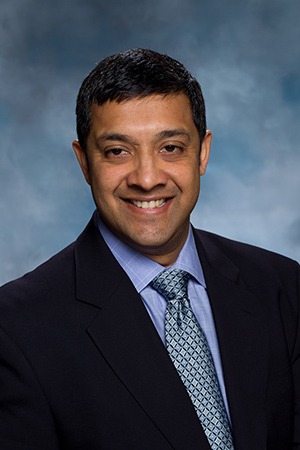 Results of a phase 1 clinical trial are being presented at the American Society of Hematology Annual Meeting in San Diego this week by lead and corresponding investigator Rajat Bannerji, MD, PhD, Hematologic Malignancies Section chief at Rutgers Cancer Institute of New Jersey and associate professor of medicine at Rutgers Robert Wood Johnson Medical School. He shares more about the work. A: This is an ongoing multicenter phase 1 study for adult patients with relapsed/refractory B cell non-Hodgkin lymphoma who were previously treated with a particular antibody therapy (anti-CD20). Patients received 12 weekly doses of the experimental drug REGN1979 followed by an every two week dosing of 12 doses for a total of 36 treatment. REGN1979 – designed to use the body’s own defenses to fight illness – targets the CD20 protein found in non-Hodgkin lymphoma (NHL) and targets another protein (CD3) found on T-cells, a type of cell in the immune system. REGN1979 is engineered to help T-cells find and destroy cancerous B cells, including those found in NHL. As of September 18, 2018, 68 patients with relapsed/refractory B-cell non-Hodgkin lymphoma were treated. The most common side effects seen so far are fevers, chills and symptoms caused by activating the immune system called cytokine release syndrome (CRS). CRS may result in fevers, shaking (rigors), fatigue, muscle aches, and changes in blood pressure among other symptoms. No significant neurotoxicity has been seen so far in the study. This is an important observation because some currently FDA-approved immunotherapies can cause serious brain toxicity. REGN 1979 treatment has resulted in activity against the two most common types of non-Hodgkin lymphoma including follicular lymphoma and diffuse large B-cell lymphoma. As the dose of REGN 1979 has been increased in the study, the response rates (the percentage of patients whose lymphomas have gotten smaller with treatment) have improved. At the highest dose levels reported at the ASH meeting, the response rate in diffuse large B-cell lymphoma is 60 percent. The response rate in follicular lymphoma is 100 percent at all dose levels from 5mg to 40mg. We are continuing to look at treatment with higher doses of REGN 1979 in the study. A: These results are significant because the treatment works by recruiting the patient’s own immune system to fight the lymphoma. By using a non-chemotherapy strategy to treat the lymphoma, we have seen responses in patients who have had multiple prior treatment regimens (median of three prior types of treatment) and for whom therapy no longer works (treatment refractory). A: This was the very first clinical trial with this drug, REGN1979. This trial continues to study REGN1979 as a single agent in patients with relapsed/refractory non-Hodgkin lymphoma as well as in patients with chronic lymphocytic leukemia. REGN1979 is also being studied in combination with a PD-1 antibody cemiplimab in patients with relapsed/refractory non-Hodgkin’s lymphoma in another ongoing clinical trial. Its full potential will be studied in future trials looking at specific types of lymphomas and also looking at combining it with other treatments including other types of immunotherapy. This trial was sponsored by Regeneron Pharmaceuticals, Inc. Author disclosures and other details can be found here: https://ash.confex.com/ash/2018/webprogram/Paper113328.html.